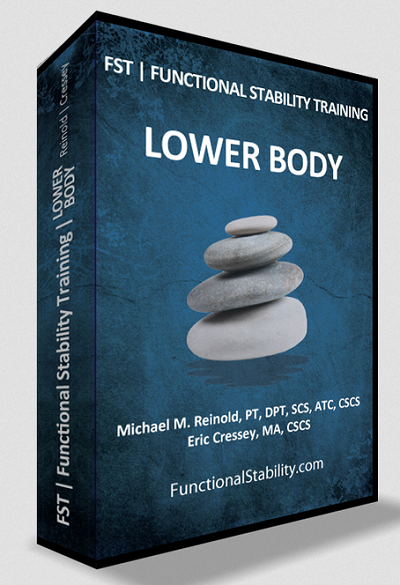 Functional Stability Training for the Lower Body takes a hard look at the lower extremity and how to most effectively optimize function. By addressing alignment, strength, mobility, and dynamic motor control, you can maximize your rehabilitation and training programs to reach optimal performance. The lower extremities work in conjunction with the core to provide mobility, strength, and power to the entire body. Any deficits in stability throughout the lower body’s kinetic chain can lead to injury, dysfunction, and a decrease in performance. FST for the Lower Body aims to help formulate rehabilitation and training programs designed to optimize how the lower body functions. The FST for the Lower Body program can be applied to rehabilitation, injury prevention, and performance enhancement programs. For the rehabilitation specialist, the information will help you restore functional activities faster. For the fitness and performance specialists, the information will help you achieve new progress with your clients to maximize functional and athletic potential. For the fitness enthusiast, the information will help you gain control of your lower body, maximize functional movement, and reduce wear and tear due to faulty movement patterns. Train the Lower Body to Maximize Function while Minimizing Poor Movement Patterns. Simple, yet highly effective.